When I have free time I tend to try to come up with a new tasty sauce. This time I started with the BBQ sauce basics and put a nice twist on it. Raspberry Jam! In this case I was looking for a unique flavor to complement spicy wings. This sauce flat out rocks! Start off with a medium sauce pan and add all the ingredients listed above. It's just that easy! Once the ingredients are in the pan turn the heat on to medium. Slowly stir the contents and bring the sauce to a simmer. 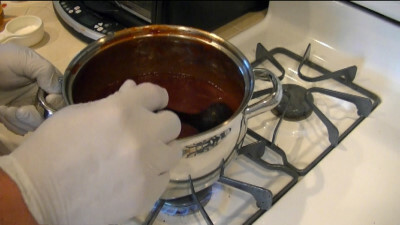 When the sauce begins to simmer reduce the heat to a medium low. Continue to simmer. 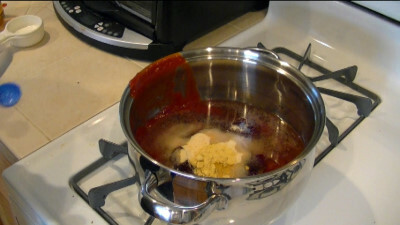 Stir occasionally and make sure the sauce is well mixed and free of lumps from the sugar or mustard. Let the sauce cool and your done. When using this sauce on wings, ribs, etc, mop it on during the last 1 to 1.5 hours of smoking. When cooking at 225 - 250 this sauce will glaze nicely and doesn't burn easily. This sauce is amazing on wings so give it a try!